A nationwide art tour set up by three expats will make its final stop in Seoul this week, but the organizers hope its effects will continue through the connections it creates. “Look But Don’t Touch” is a nationwide art tour set up by Sybille Cavasin, Wynsum Foreman and Lawrence Blackman, showcasing the work of artists from across Korea. “At the end of it I hope there will be the beginnings of a community where people can talk to each other and get to know each other,” said Blackman. Nine visual artists are displaying work at each show, but the events themselves have featured different performers and have had their own art markets, giving each one a distinctive flavor. 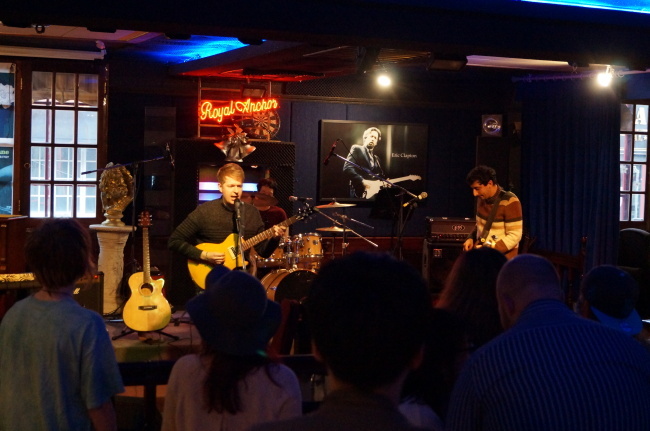 Mountains performs at the Royal Anchor during the Ulsan stop of the “Look But Don’t Touch” art tour on March 5. “That’s kind of been what’s good about it really. What we’ve ended up with has been different people meeting artists from different cities, artists I didn’t know and I’m pretty sure that other people didn’t know,” said Blackman. He said Big Day South, a festival gathering artists based in southern cities in which Cavasin and Foreman have been involved, was an example of how forming connections can lead to bigger things in the future. “Bracket and angle are nonprofit magazines, but that shows their value, having those things as focal points has given birth to things like Big Day South and so on,” he said. 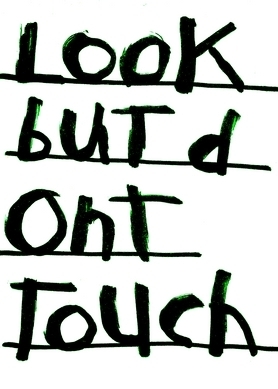 It was Bracket that led to the creation of “Look But Don’t Touch.” After his work was featured in the magazine, he exhibited at the magazine’s Gallery(t). There he met Cavasin and talk of holding an event together snowballed. The first in Busan on Feb. 20, had a coffee-shop vibe with performance art, he said, while the following one, in Ulsan, was a larger event with a greater focus on music. Saturday’s event in Daegu featured performances from a collective of poets and a performance art piece. The last stop on the tour will be in Mullae-dong, Seoul, an area developing a reputation for its grassroots arts scene. Blackman said the venue, Our Monster, was small, but he fell for the place when he visited it for another event. “I really loved it. It was ‘this is Korea.’ There was an old metal workshop (area) which is really raw, but it’s having all these different things growing out of it,” he said, referring to the artistic activity that has grown up in the industrial district. As well as the artists displaying their work, there will be acoustic music from Tierpark, as well as a performance art piece by Blackman. The event starts at 5 p.m. Admission is free. For more information, visit the Look But Don’t Touch Facebook page.